Check out the READYColorado Facebook Page. If you are not already following, READYColorado also maintains a READYColorado Twitter feed in addition to their main site. For information on Colorado citizen preparedness efforts emergency kits, and much, much more - be sure to follow them. There have been a number of changes lately -- update your address books and numbers for Division of Emergency Management Staff and Colorado Sheriffs and Local Emergency Managers. 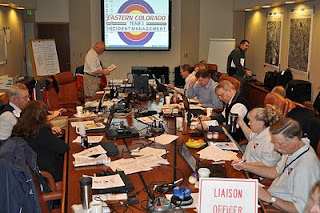 As we are, again, preparing for another State-level Emergency Operations Center (EOC) exercise, our exercise planner, Tony Riedell - tony.reidell@state.co.us - has been busy going through historical reports and building a case study to help prepare players in the exercise for real-world history of Colorado tornadoes. After reading the initial draft of his Background section for our exercise manual, I got Tony's OK to post it here since I think it is an interesting study on Colorado's tornado history. In June 1990 the Limon Tornado caused $25 million in damages with 117 homes and 23 businesses destroyed. 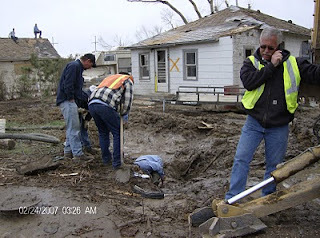 The Fire and Police departments, Town Hall and the Post Office were all damaged along with the loss of phone service throughout the entire community. Most tornados in Colorado occur between May through mid August with the major (75%) occurring between noon and seven in the evening, and generally moving from southwest to northeast. The peak season is somewhat smaller with two thirds of tornados developing between May and June; a fact no one should get comfortable with, statistically or otherwise. During the last decade, Colorado averaged 60 tornados a year. This can vary from year to year and reached a record 98 reported in 1996. 1998 saw that number drop to a reported 38 tornados. Increasing population, urban sprawl, greater numbers of trained spotters and improved communications have all contributed to more accurate tornado reporting in each of the decades since the 1960s. On average, tornadoes kill about 60 people per year nationally, with most resulting from flying or falling (crushing) debris. In this, Colorado has been somewhat fortunate in that we have had only 2 or 3 fatalities since the mid “60’s”. These statistics, while interesting, belie the true nature and devastation of the threat. In 2007 an EF3 tornado found a “blind spot” in Colorado’s Doppler radar coverage. Without notice, at 8:11p.m., that tornado cut a 4 block wide, 2.2 mile long swath through the southeastern Colorado community of Holly. With a population of 961, Holly suffered 35 homes destroyed, an additional 32 damaged with 11 people injured, 7 of which were serious enough to require transport and hospitalization outside of the region. Compared with other States, Colorado ranks number 9 for frequency of Tornados, 38 for number of deaths, 31 for injuries and 30 for cost of damages. When we compare these statistics to other States by the frequency per square mile, Colorado ranks number 28 for the frequency of tornados, number 38 for fatalities, number 37 for injuries per area and number 37 for costs per area. Based on data from 1950 - 1995. The lone fatality in Holly, you may recall, was the mother of three. The numbers would indicate the loss of 25% of available housing, but the numbers can’t tell the whole story. 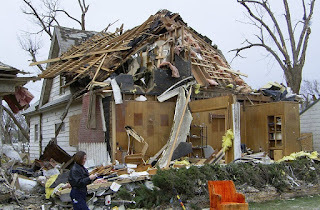 On Friday the 23rd of May 2008, the largest of several tornados to develop north of Denver, plowed northwest through the community of Gilcrest to Windsor. Moving at a steady rate of 30-mph, it pulled down power lines, damaged or destroyed a day care and at least 60 homes, derailed part of a train including tankers and cattle cars, tore up irrigation systems and farms. Accompanied by baseball size hail, the storm caused multiple crashes and some injuries on area roads and rolled several semis off U.S. 85 north of Gilcrest. At the upper end of its path the tornado struck the west edge of Evans and western outskirts of Greeley. It slammed into the headquarters of Swift & Co. and the regional headquarters for State Farm Insurance; thus insuring both the great and the small equally felt the pain. While an EF3 Tornado, such as the one that hit Holly or Windsor, has only a 3.4% relative frequency of occurrence, it contains sustained winds of between 136 and 165 mph. They are typified by definition as producing “Potentially Severe Damage” to include precisely what has occurred: Entire stories of well-constructed houses destroyed; severe damage to large buildings such as shopping malls; trains overturned; trees debarked; heavy cars lifted off the ground and thrown; skyscrapers twisted and deformed with massive destruction of exteriors structures with weak foundations blown away some distance. In the arena of training and exercise, with regard to the subject of artificiality and scope of scenario, tornados in Colorado have provided ample room to test all aspects of response and recovery. With a tornado scenario a jurisdiction can move simultaneously at STARTEX from response into recovery. As it turns out, tornados are so wild and unpredictable that if a design team can imagine it you can just about rest assured it took place in recent history. 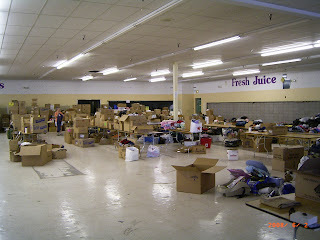 On Sunday the 7th of June, 2009, an otherwise quiet afternoon in southeast Aurora was interrupted by a twister moving south southeast across residential areas, apartment complexes and the Southland Shopping Center. 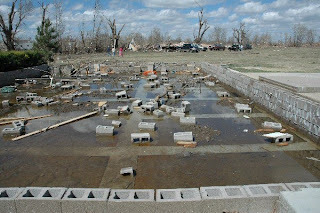 While in this instance the National Weather Service rated it as “only” an EF1 with winds of 100 mph, the rest of the story is that it was one of five tornados that struck that day. The others were reported in the area of 144th and I-25, one was reported five miles south of Bennett, one five miles south of Deer Trail and one three miles north of Byers. Many years earlier, Denver experienced an incredible incident when a tornado touched down at the southeast corner of Evans and Broadway. Like the finger of fortune it took the roof off of a Taco Bell and immediately disappeared while barely disrupting lunchtime traffic. The bottom line with tornados is, be vigilant, be prepared, and expect the unexpected. 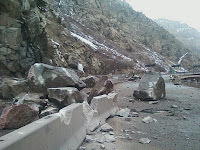 This morning's slide in Glenwood Canyon on I-70 (pic via CDOT Twitpic feed at http://twitpic.com/photos/ColoradoDOT) reminds us that living in mountain communities brings with it a host of hazards for which residents and travelers must be prepared, including wildfires, winter storms, avalanches, and rock or landslides. 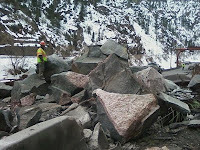 For the latest on the i-70 rockslide and for travel conditions, check http://cotrip.org/ or http://coloradodot.info/ or follow the Colorado Department of Transportation on Twitter at http://www.twitter.com/coloradodot. 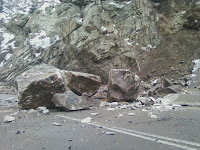 Landslides occur when masses of rock, earth, or debris move down a slope. They may be small or very large, and can move at slow to high speeds. 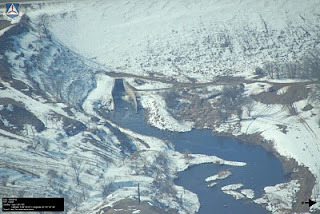 They are activated by such things as storms and fires, earthquakes, volcanic eruptions, rock and soil weakened through saturation by snowmelt or heavy rains and excess weight from accumulation of rain or snow, stockpiling of rock or ore, or waste piles. 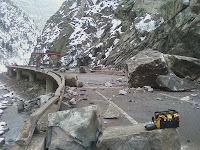 Man-made structures may stress weak slopes to failure creating a landslide. Slope materials that become saturated with water may develop a debris flow or mud flow. 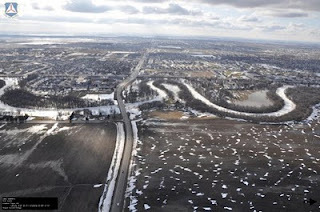 The resulting slurry of rock and mud may pick up trees, houses, and cars, thus blocking bridges and tributaries causing flooding along its path. 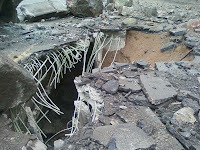 Landslides occur in every state. The Appalachian Mountains, the Rocky Mountains, and the Pacific Coastal Ranges and some parts of Alaska and Hawaii have severe landslide problems. Any area composed of very weak or fractured materials resting on a steep slope can, and probably will, experience landslides. Too, check out http://readycolorado.com/ for additional information on how to prepare a car emergency kit, just in case you ever get trapped or stuck in your vehicle and be safe and be aware! On April 8, 2010, Colorado State University-Pueblo's Political Science Department and its Center for the Study of Homeland Security will host a Colorado Economic Development Forum. The forum will focus on "Homeland Security Threats/Opportunities" and will be held in the Rawlings Library, 100 E Abriendo Ave. in Pueblo, CO from 5:30 pm - 9:00 pm. 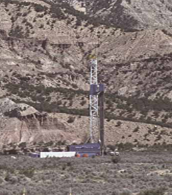 The focus of the event will center on the key concerns of federal, state and military authorities, on the role Pueblo area businesses can play in critical infrastructure protection, and how can local business and community organizations earn contracts with the Department of Defense. The event will include hors d'oeuvres and dinner and a panel of speakers, including the Division of Emergency Management Director Hans Kallam. Also speaking will be Joe O'Keefe, Protective Security Advisor, U.S. Department of Homeland Security; Joseph Catalino, Jr., Chief, Private Sector/NGO Division, Interagency Coordination Directorate, NORAD and U.S. NORTHCOM; and David Malet, Director of CSU-Pueblo's Center for the Study of Homeland Security. For more information, contact David Malet at (719) 549-2800 or at david.malet@colostate-pueblo.edu. From Carolyn Bluhm, Community Relations Specialist with the City and County of Denver, Mayor's Office of Emergency Management and Homeland Security. If you have any questions about this program, contact Carolyn at (720) 865-7698 or via email at Carolyn.Bluhm@denvergov.org. “Take PART” is Denver’s Citizen Emergency Readiness Training (FEMA course IS317), is a partnering effort between emergency services and the people they serve. 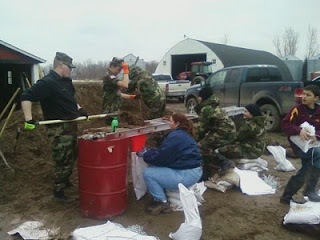 The course is for emergency personnel to train people in our communities in basic preparedness skills. 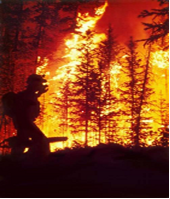 This disaster preparedness and readiness training program will include how to plan for a disaster and basic response skills such as fire safety, light search and rescue, team organization, disaster medical operations, public health information and terrorist information. At the completion of this training, participants are encouraged to support emergency response agencies by taking a more active role in emergency preparedness projects in our community. How much: NO COST to participants. For more information about additional training opportunities, contact the City and County of Denver, Mayor’s Office of Emergency Management and Homeland Security: visit www.Denvergov.org/oem, email DenverCERT@denvergov.org or call (720) 865-7600. Please Note: “Take PART”, Denver’s Citizen Emergency Readiness Training program is not a “Community Emergency Response Team” or organization. There are few volunteer days that can be more insightful and useful to your local emergency responders than supporting exercise play. Often, volunteers are asked to be victims or players such as onlookers, media, etc and make the training much more realistic for the police, firefighters and paramedics. 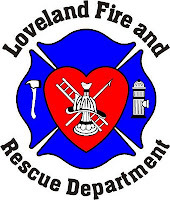 On Saturday, 5 June El Paso County first responders will be conducting a full scale exercise. They are looking for people to be role-players/victims for this event. If you are interested please see the attached flyer for how to sign up. Victims will be moulaged. Our moulage "artists" are very good at their art so if you are easily bothered by the sight of blood you might want to pass on this opportunity." Participating agencies are all 26 fire departments, Memorial and Penrose Hospitals, Flight for Life, Memorial Star, American Medical Response, several military installations, and the Hanover School District.